Take your music anywhere, whether it’s on holiday or to work. 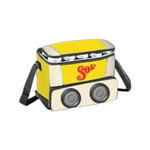 This portable iPOD speaker provides high quality sound, along with an insulated ice chest for your beverages. Plug into your target audience with this stylish and functional promotional tool.